​Camp Tekakwitha is a privately owned, privately funded religious camp. Located in St. Clair County, Alabama, the camp is on 120 acres of hills with a chapel, seven acre lake, walking trails, lodge and pool. The camp is a place of retreat, designed for like-minded youth groups, parish organizations and clergy within our diocese committed to the same mission as the Catholic Church. At this camp the Diocese of Birmingham in Alabama seeks to teach by act and deed the principles of our religion. The Diocese reserves the right to deny access to any group or individual. Proselytizing of other users or groups is not permitted and may cause your group to be removed from the camp. 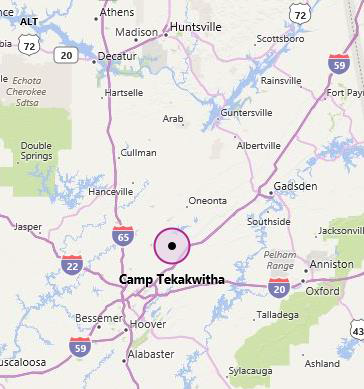 Camp Tekakwitha is a little bit of wilderness in St. Claire County, Alabama. It was purchased from Mrs. Ethel Owen Zuber in 1950 to create a summer camp for Catholic boys and girls. The camp was built under the leadership of Fr. John Brunson who selected the property, raised funding and oversaw construction. Fr. Brunson also became the first camp director. At it's height, the camp had room for 140 campers. The Knights of Columbus have always been a big part of Camp Tekakwitha. From the very beginning they provided material support for the operation of the camp. As time went on and the Bishop decided to get out of summer camping the Knights picked up the ball and operated the camp. Taking full management responsibility, the Knights of Columbus State Council continued to serve Catholic youth for two years. For various reasons the camp was closed sometime around 1989. In February of 2010 Bishop Robert Baker decided to begin the process of reopening the property as a location for Boy Scout camping and to provide the Kateri Circle a place to gather. The Kateri Circle is a group of Native American Catholics. The camp is located in Southwest St. Claire County near Springville, Alabama. The property is not open to the public. Tours can be arranged but permission must be granted to enter the property - it is posted "No Trespassing." In addition, there is no hunting on the property and fishing is only with express permission. Use the "Contact Us" page to let us know of your interest. The logo is in the shape of a turtle for two reasons: 1. Kateri Tekakwitha, the native American saint for whom the camp is named, belonged to the Turtle Clan of her people. 2. We have many turtles on the property. 3. The turtle is symbolic of many important things; it can represent "wisdom" and the creator of the world. Important reminders as we enjoy this special gift from the Creator. The fleur de lis is, of course, "flower of the lily" in French. It represents Kateri who is known as the "Flower of the Mohawks." The CT in the middle of the logo is based on the original camp logo, still seen in the design of the main gate. In our logo the T has a special meaning, it is the "tau cross," an image often used to represent the cross of Christ.